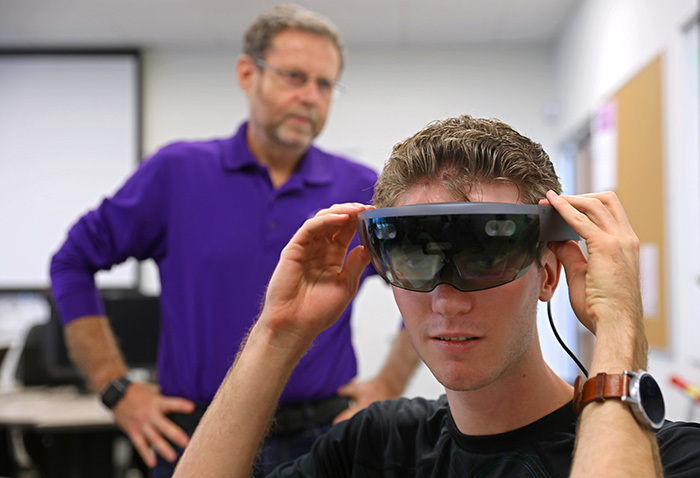 Dr. Isac Artzi (background) has students using a Microsoft HoloLens to bring to life Bible scenes. For as long as he can remember, Dr. Isac Artzi has been fascinated with the Star Trek Holodeck, where characters can escape their own reality by nuzzling up to virtual reality. He can imagine being suddenly transported, like Capt. Jean-Luc Picard, from the 24th century to a 1940s-style gangster adventure. Or the Renaissance. Or a 20th century football game. That fascination might be why Artzi, the College of Science, Engineering and Technology’s Computer Science lead, is so drawn to the Microsoft HoloLens, a self-contained holographic computer in the form of spacey-looking smartglasses that allow the wearer to interact with holograms — programmed, not-really-there images visible only through the glasses. It is through the HoloLens that Grand Canyon University computer science students are taking their own baby steps through the world of virtual reality, and they’re doing it in a way that only GCU can do it: by integrating faith and science. Artzi was looking for a unique way to weave GCU’s Christian worldview into the discipline of computer science. “I’m very interested in the Bible, but not just the faith side of the Bible. I’m interested in the history and the linguistic history of events and the history of the language. And I’m very interested in how things came to be,” he said. He thought, why not take Bible stories and have computer science students bring them to life through virtual reality? Students in Artzi’s Human-Computer Interaction and Communication class have been delving into the Virtual Reality Bible Project since the beginning of the semester. Seven groups of students, three to a team, have been busy programming stories such as the parting of the Red Sea, Jonah and the whale, Peter walking on water, Noah’s Ark and the birth of Jesus. Leticia Galarza, a junior computer science major, squinted her eye at the scene on her laptop during one Monday morning class. In it, a “mini Moses” stood on the shores of a GCU student-approved Red Sea. The team, which completed the storyboard for its project at the outset of the class, was in the midst of downloading a tool kit that would allow the HoloLens to map out an area on which to display the scenes. The students created visuals using Unity and the C-Sharp programming language and also had coded parts of their project in Microsoft Visual Studio. Then there’s the other side of the Virtual Reality Bible Project. Galarza’s classmate, Trevor Godfrey, relayed how it is a clear way GCU incorporates Christian worldview into his coursework. “This is, honestly, probably going to be the coolest project I’ve worked on,” he said.